Everett Tree Service offers customers throughout the Holly Springs area with tree removal services, unparalleled in professionalism, promptness and attention to detail. We work to ensure each tree removal service in Holly Springs is completed on time and leaves no mess behind. Our team includes experienced tree climbers, crane operators, tree climbers and truck drivers that are trained in safety and proper tree removal practices so your home or place of business is in good hands. We are fully insured & licensed and can safely remove trees from around structures using our crane and other specialized equipment. 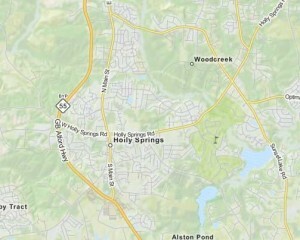 Holly Springs residents and commercial customers expect the best. We know you are looking for a tree removal service in Holly Springs that offers a fair price and knowledgeable professionals who can recommend the best course of action for your property. We serve the zip code of 27540 and will respond quickly to your call or email to schedule your free estimate. Contact us today for more information or call (919) 271-6108.